The company that once championed SIP and sold expensive PBX gear and expensive handsets for the offices has been losing influence in the new world of collaboration and communication. For a long time Cisco has dominated the unified communications business. Cisco, thanks to its nose-bleed inducing price tags, is aimed at companies with deep pocket books. Skype, on the other hand, is for real people and small businesses. Cisco is extremely worried that Microsoft will now take Skype further into the corporate community, and that big companies will stop buying its gear. Cisco’s De Beer in his conversation earlier this morning wouldn’t go as far to admit it outright, but he did say that it was causing them problems with their corporate clients. The argument De Beer made was that just like any voice phone can talk to any other voice phone, video calls should have similar interoperability. Chambers confirmed this when he explained that Cisco’s customers asked it to make this move because they wanted their Cisco software and the Microsoft (plus Skype) software to work together. That’s right, Skype was a threat and now with Microsoft’s corporate cachet, it’s an even bigger threat, so now Cisco wants it to play nice — or just play with it. 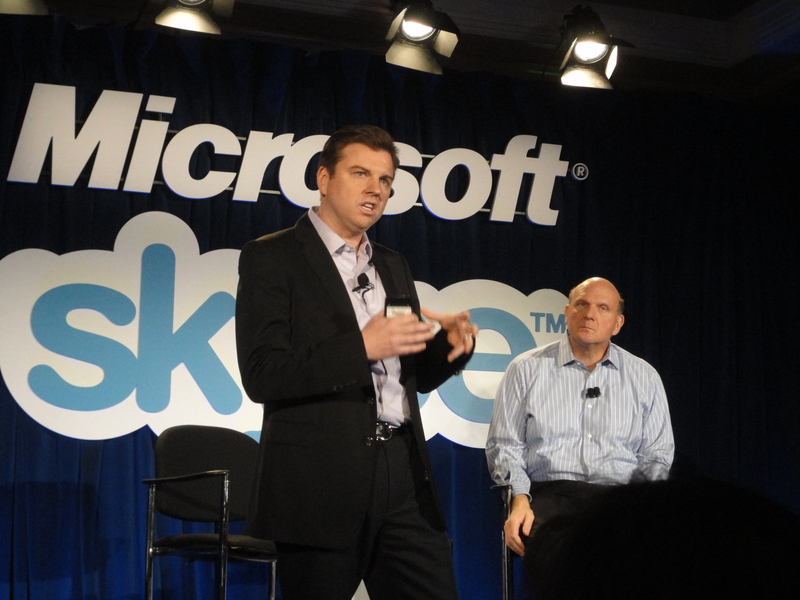 Chambers also said that Cisco had been trying to work out a deal with Microsoft on this, but had gotten nowhere. The problem for Cisco is that it didn’t buy Skype a while back to avoid alienating its service provider customers. However, today when IP communications are the only communications, and the core of many lines of business for Cisco, thinking about that service provider subset of customers now means Cisco frustrates another set. For Cisco the growing importance and prevalence of a single network across all lines of business is both a curse and an opportunity. Consider Linksys, Flip and the very relevant $3.3B purchase of Tandberg – the maker of the “telepresence” systems that cost as much as a car while providing all the functionality of Skype and a $100 webcam. That’s what this move is really about, adding value to their failing Tandberg investment. Also, this piece demonstrates a lot of what I’ve grown to hate about Cisco as a customer. They pander to their largest customers (service providers in this case) at the expense of everyone else and their own growth. Cisco’s unified communications sales appear to have lost their momentum! I have seen your comments many time. You are a Cisco basher. Go Away ! Classic penny wise pound foolish mistake, they could have owned the protocol and the standard with 700 million plus customers and done interesting things with it. Of course that meant doing business with Charlie Guancarlo and Tony Bates and other ex-Cisco types. Cisco will (and should never) try and go beyond its core capabilities — switches, routers and other networking gear. It might seem that Cisco has staged a recovery, but at best it is a company with lukewarm prospects. This move to cloud services model is going to trip many companies especially those that have deep relationship with service providers such as Cisco. The fear of offending SPs is going to make them flat footed. As to interoperability, the video conferencing industry collectively punted this issue until now when innovative startups such as our company Blue Jeans Network made interoperability the key value proposition by making Microsoft Lync and Skype work with Cisco Telepresence. Classic mistake. Cisco is by no means alone in this. If you don’t innovate to replace your profitable high margin business, somebody else sill do it for you. Telepresence will have a hard time making it beyond some big companies and banks. Skype already dominates the world. The relevant question was not whether it was going to conflict with Ciscos Telepresence product line, but whether Cisco would reap the benefits of Skype instead of someone else. It turned out Microsoft did. i think it was less TP and more the mobile and wireline operators that Cisco was worried about offending.